I've been wanting to make these gym shorts for a long time but life got in the way. The girls all do classes at the local gym, and they all dislike leotards. So the alternative is to wear sport-camisoles with gym shorts. And these gym shorts are also lovely as modesty undershorts when the girls wear skirts and dresses. They're made with lycra-blend fabric i.e. 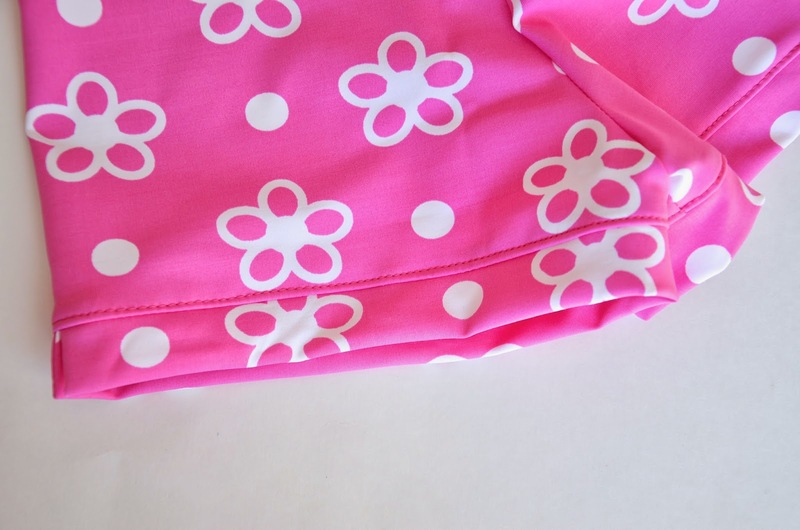 what you'd make swimsuits with, so they're stretchy and streamlined. And I love the fit. 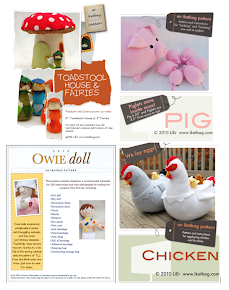 Here are our templates, if you want to make your own. 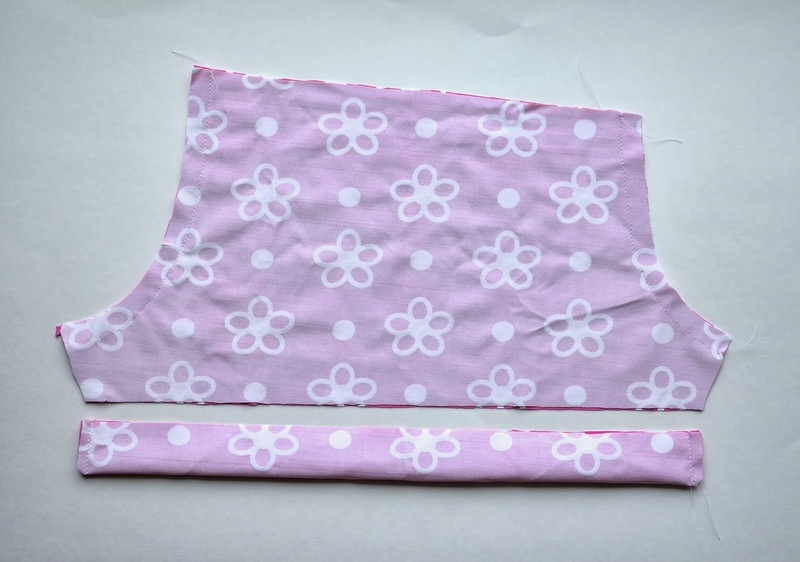 The size charts for the two sizes are in the notes (page 3), along with instructions on how to assemble the templates, add SA and cut out the other pieces for the waistband and hem cuffs. Here are the pictorial step-by-steps. 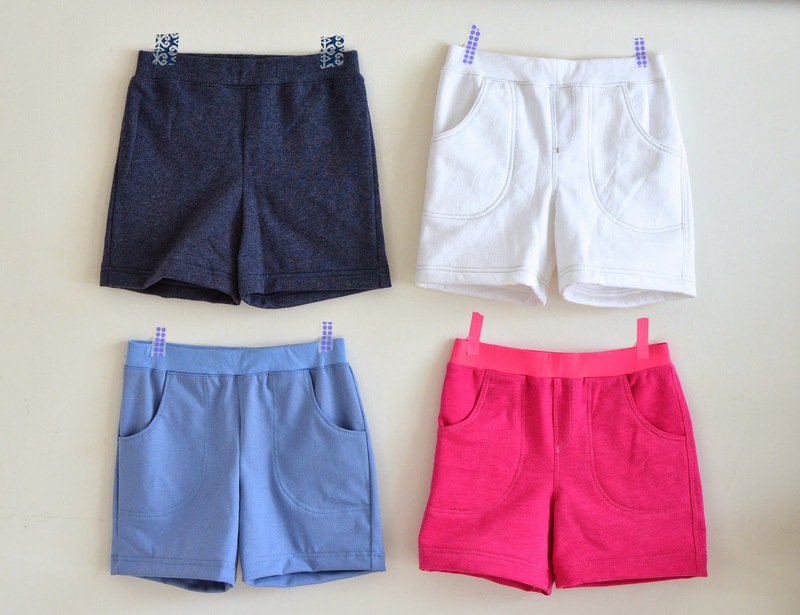 First, I will show you the traditional way to sew shorts. I like this method a lot because you sew the crotch seam last, which just sits more comfortably and correctly on your behind. So, first you sew the short little inseam, connecting the front (that's the shorter half) to the back (that's the taller half). This is one leg of the pair of shorts. Then you repeat to make the other leg. They are mirror images of each other. Then you turn one leg right side out, so they are now not mirror images of each other. Then you insert the RS-out leg into the WS-out leg so that the RS are together. 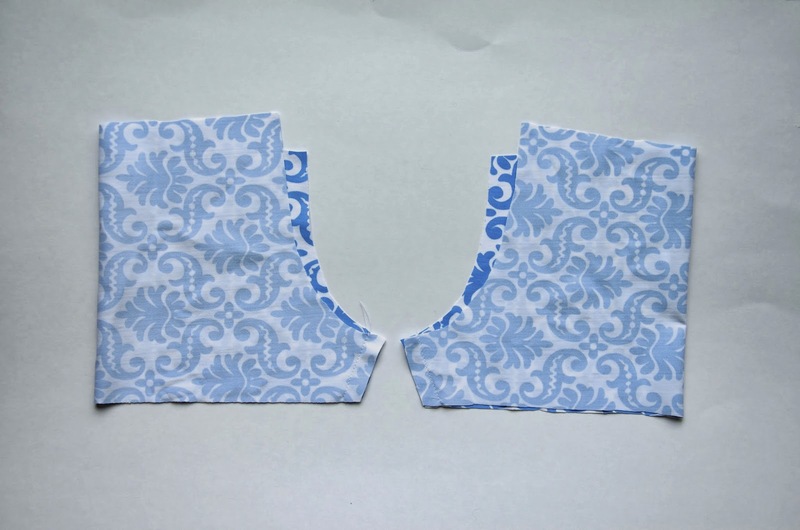 Then you line up the U-shaped crotch seam and sew it, connecting both legs together. Then you turn it RS out, sew the hem cuffs and waistband. 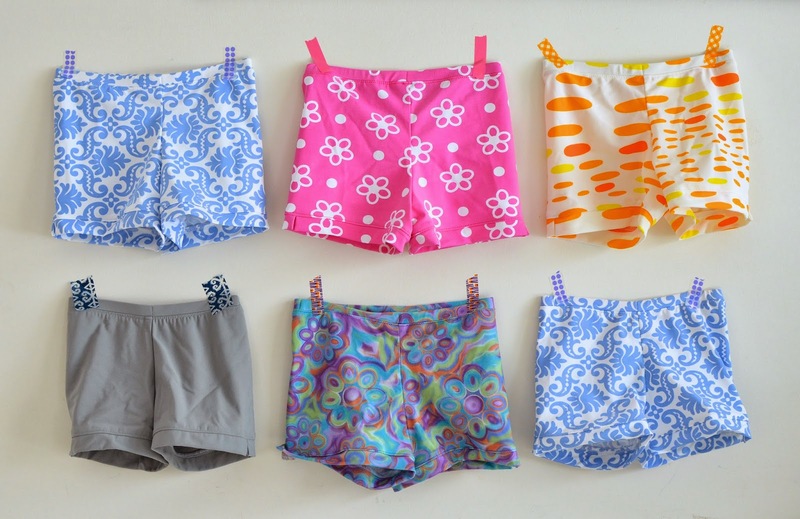 You can refer to this ancient tutorial on shorts for more detailed sewing instructions. 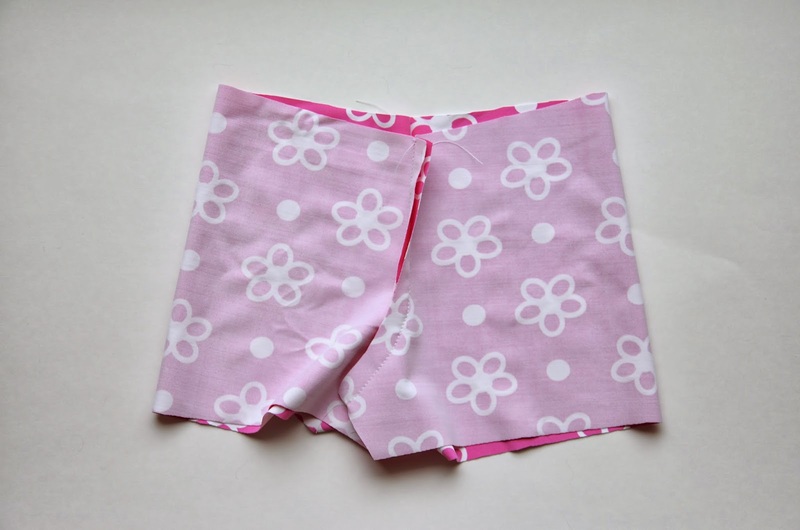 Here is the second method for sewing shorts. In this method, the curved crotch seam is sewn first, and then the inseam. I very rarely use this method, for no reason other than I just don't. However, it works perfectly well on these shorts, so knock yourself out. First, put both pieces of the shorts together (each piece is still one leg), as shown, with their RS touching. 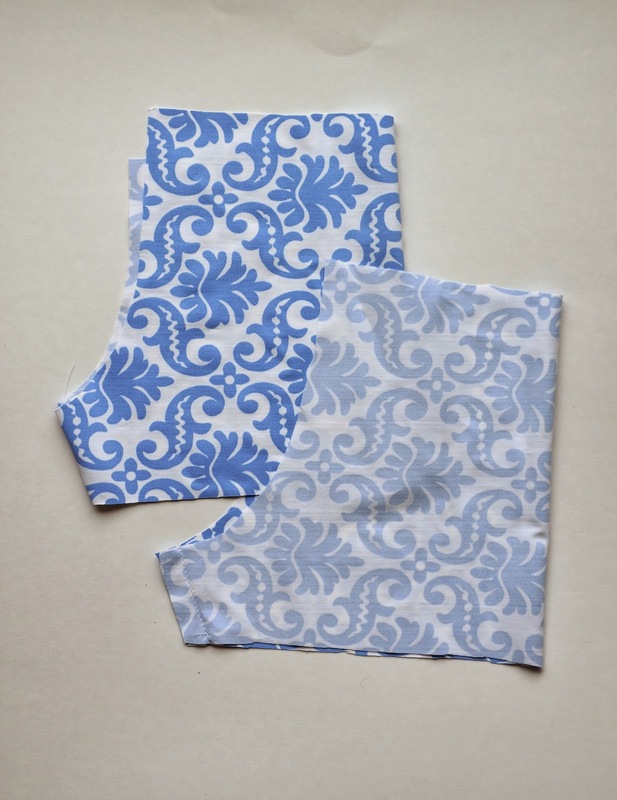 Sew both of the curved crotch seams (one is the front half and the other is the back half of that U-shaped crotch seam). In the picture below, the hem cuff is shown for reference - it is easy to visualize that the hem cuff will span the entire circumference of the leg opening. Next, open up the shorts (it will be a distorted tube) and bring those crotch seams together. 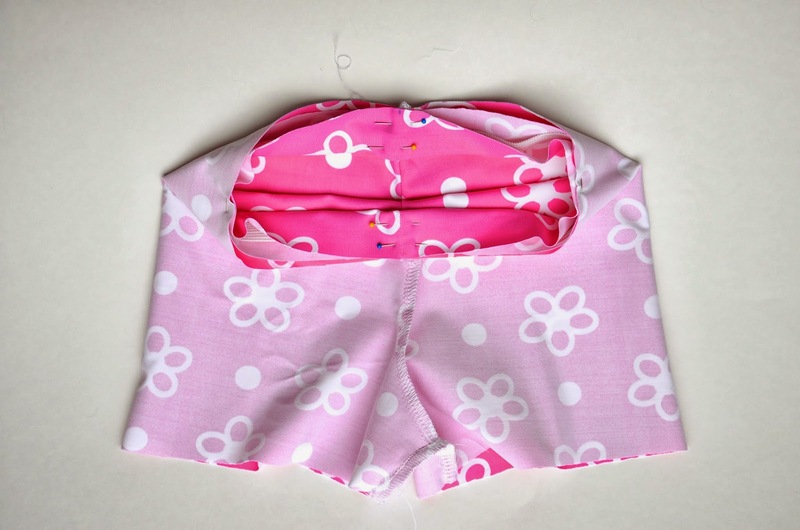 The short inseams will also come together naturally. Line up and sew those inseams together. Now, we'll make the waistband. 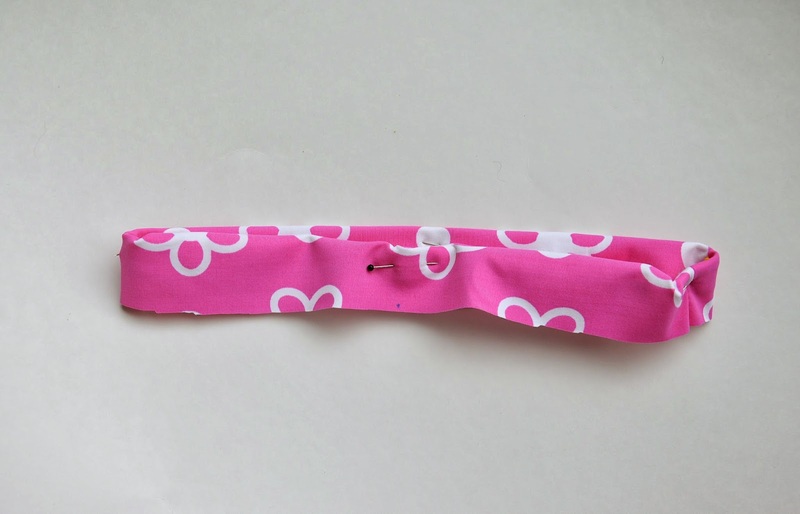 Sew the ends (overlap 1/2") of the elastic together to make a loop. 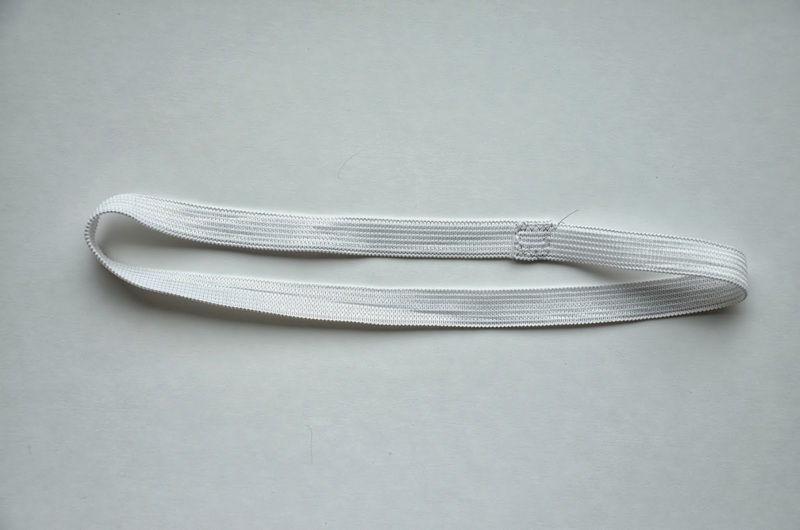 Using 1/4" SA, sew the short ends of the waistband together (RS touching) to make a loop whose finished circumference matches that of the elastic. so the elastic is completely encased. 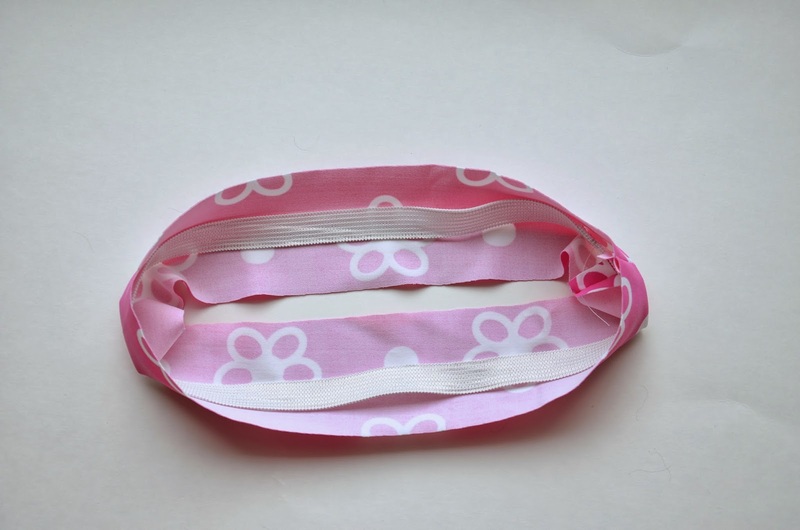 Pin the elastic in place, close to the folded edge of the waistband. 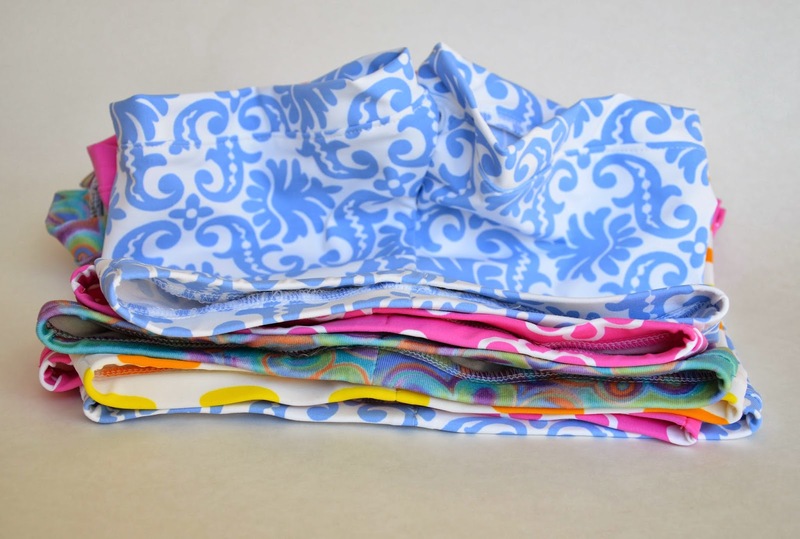 Make quarter marks around the cut edge of the waistband. 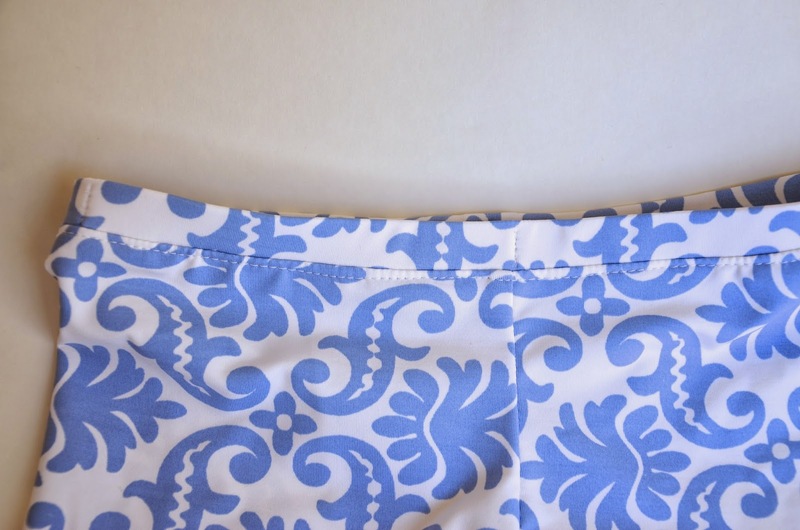 Also make quarter marks around the waistline of the shorts to match up with those on the waistband. Flip the waistband upside down so its folded edge is below, and pin it to the RS of the shorts, lining up all the raw edges. Pin in place. 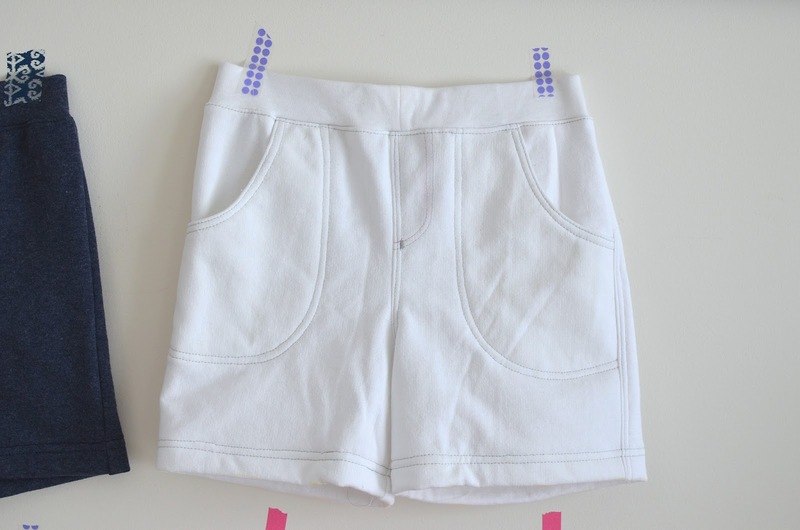 While the shorts are still WS out, sew around the waistline to attach the waistband to the shorts. Use a 1/2" SA. 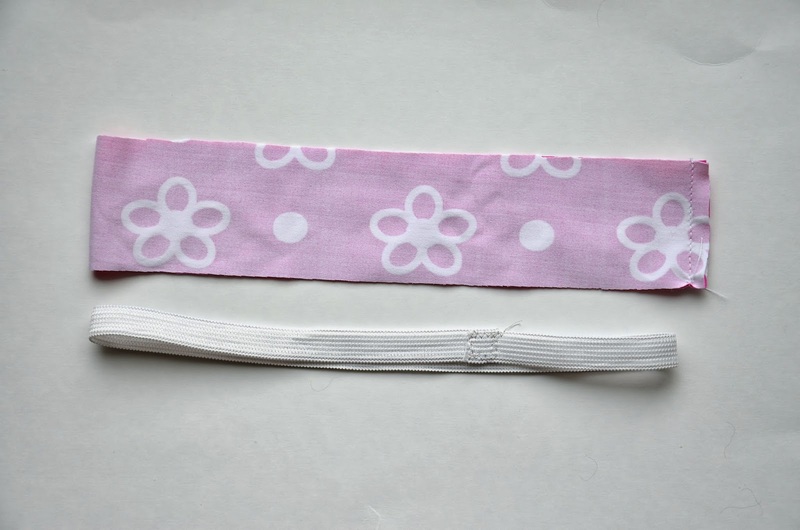 See this post for how to attach this kind of knit waistband. Here is what it looks like from the RS of the shorts. Top-stitch just below the waistband to hold the SA folded down in place. Now we'll make the cuffs. 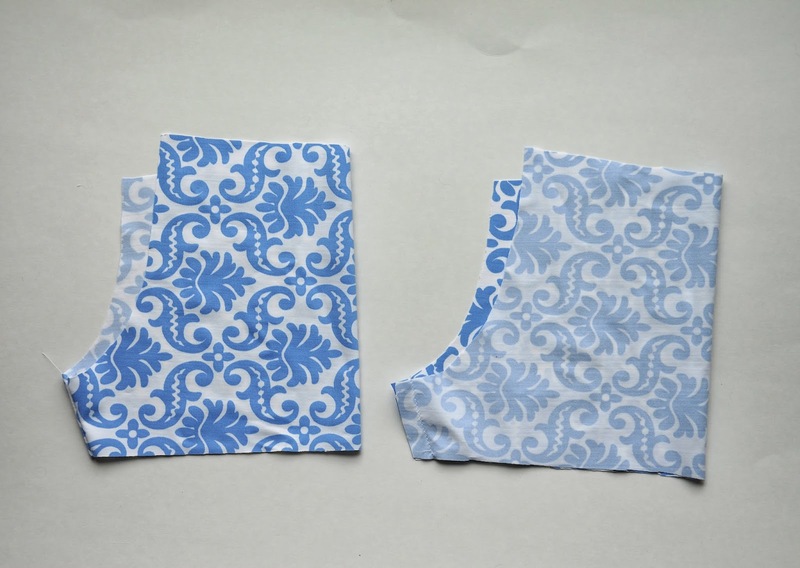 Fold each cuff in half lengthwise, and sew the short ends together, using a 1/4" SA. 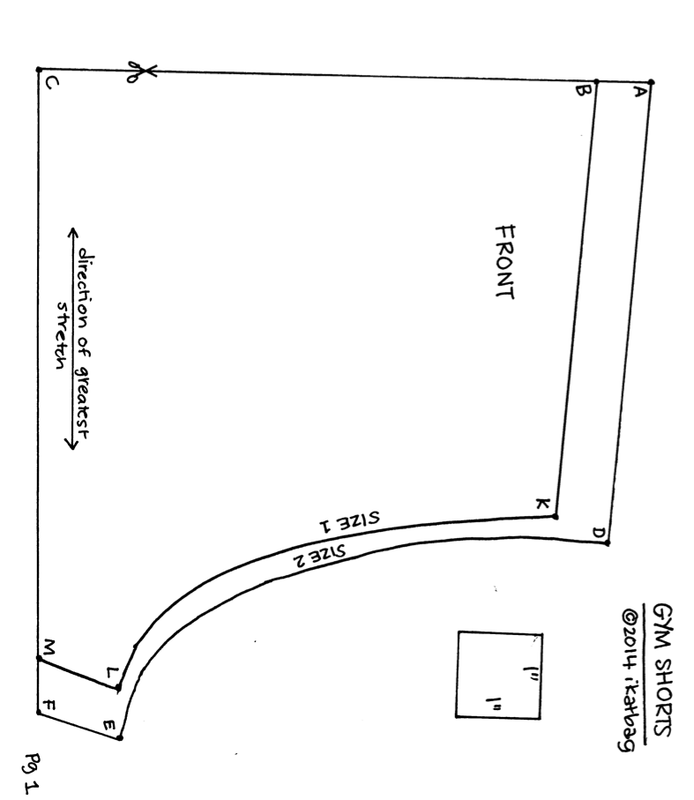 You will now have a double-layered rectangle that is 1.25" wide. Trim the corners and turn RS out. Repeat to make the second cuff. Each cuff will be attached to one leg opening. 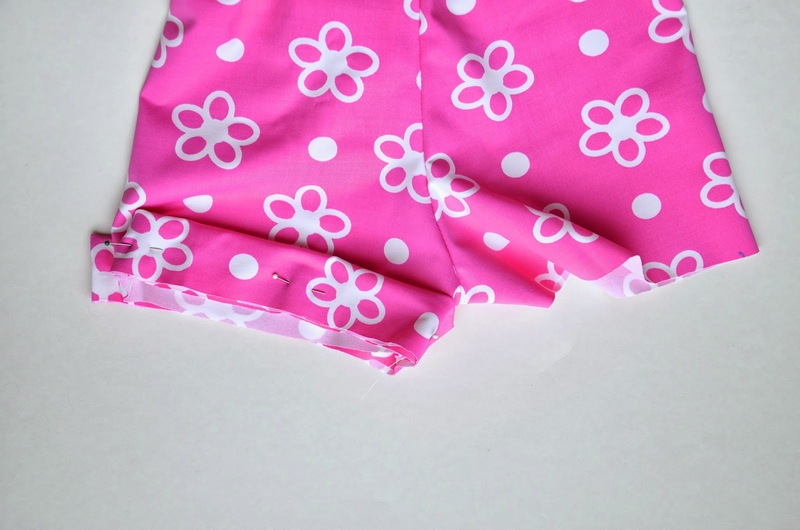 Fold the cuff in half as shown, and align its free ends (where you sewed the end seams) with the (invisible) side seam of the shorts (I marked it with a dark dot in the photo below). 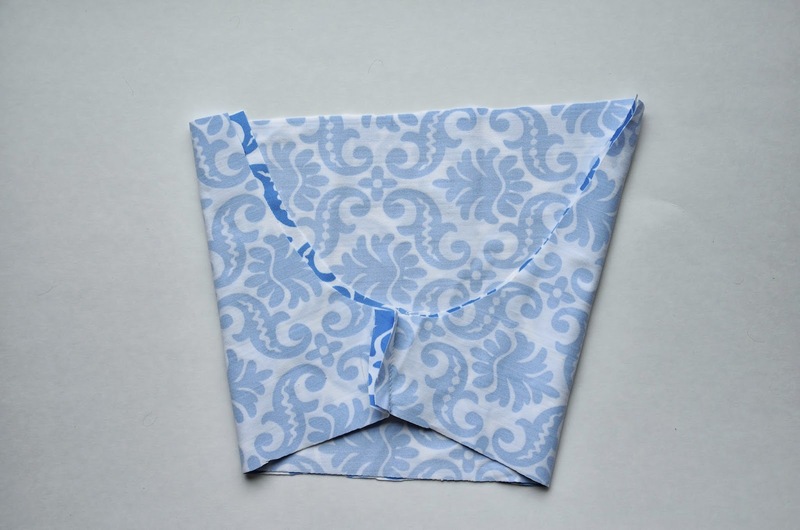 Flip the cuff upside down so its folded edge is towards the waistband, and pin it in place around the leg opening. Line up all the raw edges. Using a 1/2" SA, sew the cuff around the leg opening. You might want to stretch all the layers together as you sew, to allow the stitches some give after they've contracted. Fold the SA upwards and topstitch on the shorts (not on the cuff) to hold the SA folded up and in place. All ready to be packed away in our suitcases. Kate and Jenna are dress- and skirt- girls, so I made the gym shorts for them to wear under those dresses and skirts. Emily is a pants-girl, and wanted a different kind of shorts. So I made here these loose ones, like bermudas, with inset pockets and fake fly topstitching. No templates for these. Too tired to trace them out and explain the pockets and stuff. Thanks for sharing your template . They look like a quick make. What size/age would size 1&2 fit? makeandwear: the sizing charts are in the download. I don't understand the sizing chart and the abbreviations!!! Thank you so much for the pattern and tutorial. I make clothes for charity and this is a super good one to do. I am very grateful. Those are really nice. I love the addition of the bottom cuff. My girls wear out the knees on their leggings frequently so I have been making them into gym shorts. I am going to try and incorporate that cuff detail for a more finished look. Thank you so much!!!! I will be putting this to use a lot!! Thank you for sharing this! I need to make some of these for my skirt-loving girls. Thank you for sharing your template ! I would love to need them now... we just came back yesterday from 3 weeks of Spring in France, back to snow in Minnesota. I hope your trip will be great. Thank you! Turned out this was exactly what I needed to know when my 3 year old told me that her Barbie needed pants (knickers). oh my word, I think every little girl needs shorts or tights under skirts until she's old enough to keep her skirt down! My girl is 8 and not there yet. LOVE these! So practical! Is the split cuff a cute tailoring detail, or does it really need that split for ease? 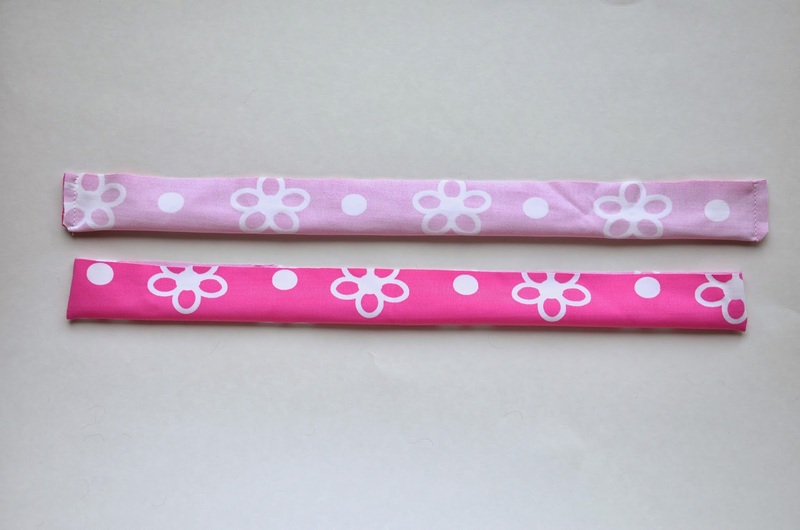 Also, why can this fabric be sewn with a straight stitch? (Maybe you explained that in the download - I didn't download it yet). 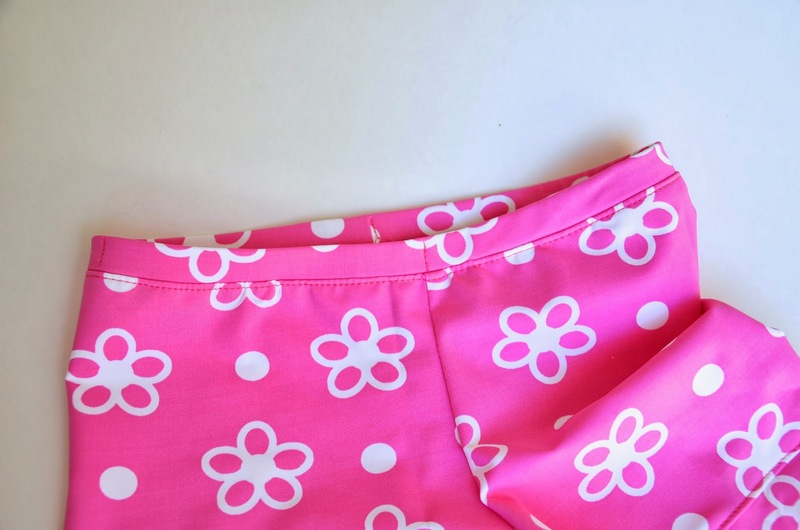 I have sewn knit shorts for my girl with a straight stitch and not a zig zag, which I thought was supposed to mimic a serger and be better for stretchy fabric. . . . I'm looking at these shorts for swim shorts. . . might even make the surf shirt to go with them if I got bold enough. . . 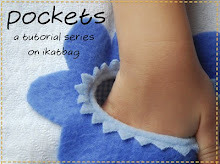 I have always wondered how to do those pockets and in typical Margo style, I would probably just wing them with strange results. I hope you get enough Nutella to explain them in the future. Thanks for sharing this tutorial. I had stretchy fabric leftovers and was wondering what to do with it. It was a quick and easy projet and it turned out great. I'll probably make a bunch of them for summer! I wrote about it on my blog (it's in French though): https://monpetitkoala.com/2016/05/02/tissus-extensible-et-couture/. Thanks again! Thank you so much for this pattern and tutorial. First time sewing in years and your instructions are easy to follow. I'm sure my niece will love these for her upcoming Gym competition. Oh my god! This is fantabulous. I never thought it will be easy to make these shorts at home. If I knew earlier I would have made Work Out Clothes for all of us rather than buying online. I understand you being tired of tracing everything but I like this post a lot and I will wait for more ideas definitely.